Find more information about soil health tests, sampling soil and management practices to improve soil health in the Comprehensive Assessment of Soil Health – The Cornell Framework Manual. When can I expect my results? Please expect an email with your results in 4-6 weeks. How do I pay? You will be contacted with a link to a secure pay-portal. This will enable you to pay by credit card if you did not enclose a check with your sample submission. Checks can be made out to Cornell University. Note: We generally reach out for billing just before or after sending out results. How do I know that my samples arrived safely? You will not automatically receive a confirmation that we received your samples. We recommend tracking your package or enclosing a note, asking for confirmation, with your soil samples and submission form. 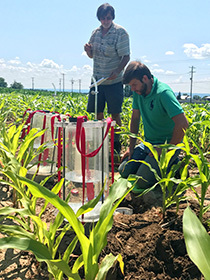 The Cornell Soil Health Lab has three categories of regulated soils: Prohibited, Domestic Regulated and Quarantined. All samples being shipped to the Cornell Lab, regardless of the category, need to be double bagged prior to packaging and shipping. Packing material such as crumpled paper or bubble wrap must be placed in the box with the samples to minimize sample movement and spillage during shipping. Prohibited Soils: There are certain counties in the US where soil should neither be packaged nor shipped. Soil received from these counties will be destroyed in our lab without processing. For a complete list of prohibited counties please visit the ‘Resources’ tab on our website. Domestic Regulated Soils: We accept soils from regulated areas throughout the United States. As with all samples, please be sure to double bag and use packing material to minimize sample movement during shipping. Special lab procedures (using Quarantine protocol) are required for regulated soils. Quarantined Soils: Quarantined soils are from any area outside the contiguous United States. Special shipping and lab procedures are required for quarantined soils. You must contact the Cornell Soil Health Lab prior to shipping quarantined soils: rrs3@cornell.edu. Quarantined samples are subject to an additional 15% surcharge. NOTE: Due to USDA-APHIS (United States Department of Agriculture, Animal and Plant Health Inspection Service) regulations the Cornell Soil Health Laboratory cannot perform the Bean Root Bio-Assay on Domestic Regulated or Quarantined soil. Please follow this link for a list of states and counties that fall under this category.